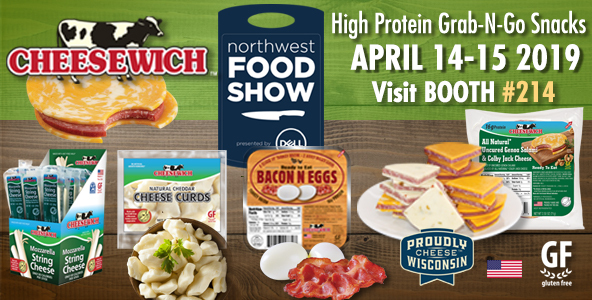 Cheesewich™ is so excited to attend this years Northwest Food Show. We will be offering samples of our growing line of keto friendly and healthy grab-n-go snacks. All boast high-protein and gluten free ingredients. Stop by booth 214 to taste Americas’ fastest growing grab-n-go brand, Cheesewich™. 8 Delicious flavors of salami sandwiched in 2 thick slices of cheese. Bringing in Halal certified as well as All Natural selections. Made with award winning Wisconsin cheese with rBST cows. Available products; Bacon N Eggs, Mozzarella String Cheese, All Natural Cheese Curds and More!